A sharp decline has been recorded in the number of Tibetan refugees in India — from 1.5 lakh to 85,000 in the last seven years — with a large number either migrating to the US or returning to China/Tibet, according to the government’s advisor on Tibet Affairs Amitabh Mathur. “Their numbers could be approximately 85,000, but we will get the exact figure once all of them are registered online. In the past two years, the government has simplified the process and made everything accessible on the internet,” Mathur told The Indian Express. As per a 2011 reply by then MoS (Home) M Ramachandran before Parliament, the number of Tibetan refugees staying in 45 settlement camps across “the country was 1.5 lakh”. The fall in numbers, officials said, could be due to various factors including absence of a national refugee policy. “Tibetans are recognised as ‘foreigners’, not refugees, because of which they cannot own any property here, neither can they apply for government jobs. 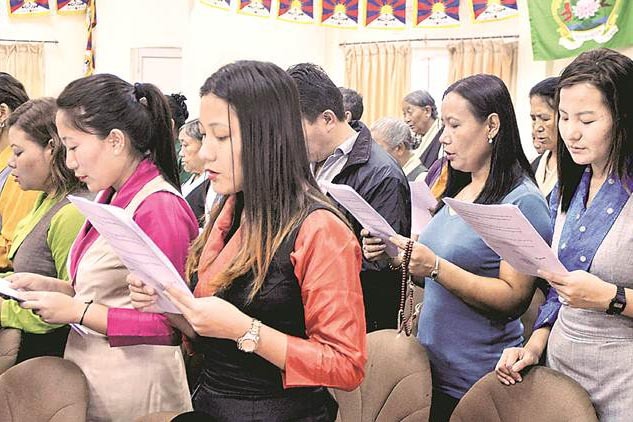 After 2014, only qualified professionals from among the Tibetan refugees are permitted to take jobs in private and non-government sectors,” said an MHA official. According to MHA’s 2009 figures, the major concentration of Tibetan refugees is in Karnataka (44,468), Himachal Pradesh (21,980), Arunachal Pradesh (7,530), Uttarakhand (8,545), West Bengal (5,785) and Jammu and Kashmir (6,920). Tibetan refugees began pouring into India in the wake of the flight of the Dalai Lama from Tibet in 1959. Mathur, who took over as interlocutor in 2015, said the government had introduced measures to “smoothen” the stay of Tibetans in India. “Tibetan migrants who are registered online are granted residential certificate for 5 years and such certificates may be renewed for five years on each occasion as and when applicable. For visits abroad, one-year multiple entry return visa is being issued by FRRO. In case migrants are shifting, they may intimate online, avoiding the need for visits to the centre and delays in manual transfer of registration,” he said. The government has listed six conditions for Tibetans (by birth) to obtain Indian citizenship. There are 7 comments so far. Gyeshe lhakdor la was indeed right in saying that Tibetans in exile are in depression mode as they they have become stiff and rustic in matter concerning the freedom of Tibet and its culture preservation. Comments from tsomo and likes of her has proved it here. The happy and cheerful Tibetan people have turned gloomy, low spirited, pessimistic and moreover of a sudpicious nature which is a recipe for a complete disorganisation in the near future. Tibetan brotherhood is vanishing from the surface and is surely a cause for concern. It is high time Tibetans did something or the red chinese will come out triumphant in this battle of facts versus fiction. It is a very auspicious news that His Holiness wished to go for a pilgrimage to china and then to Tibet. I would like to follow my lama back home and finally be settled in Tibet. Whether dalai lama returns to China or not makes no difference. People go to west when he is in India and those from Tibet don’t come to India. Indian Tibetans don’t make babies because they want to first go abroad and settle, and then have western babies. They don’t want refugee babies. In India, 90% of marriageable girls won’t marry anyone from India, but want a husband from USA , Canada or Europe. So each year, pretty girls move out, and the ugly ones remain. Next Sikyong should be a bona fide Tibetan on yellowbook and RC. Those with citizenship – either India or West – should be barred from high posts of CTA which is a charity meant for Tibetan refugees. Once a Tibetana receives a citizenship, his first priority shifts to that country, not Tibet cause due to the oath of citizenship. That is where the conflict of interest emerges. When the interest of Indian and interest of Tibet clashes, a Tibetan holding Indian passport should stand on the side of India due to oath of loyalty. The same applies for an American citizenship holder. This loophole in the system of CTA poses serious threat to the continued existence of CTA. A secret agent can be paid for run for sikyong and wreck havoc. I strongly feel that the Tibetan Parliament in exile should be for the Tibetans (in letter and spirit). We should not have American or Indian citizens deciding the fate of the real Tibetans in exile. These people holding citizenship of different countries should contribute to the development of the community in exile as they have after all they or their family members in the past enjoyed the facilities by the TGIE. How can someone whose heart and mind is in America understand the need of the people in exile? I am sure that the number is even lower than 85,000 in India. According to the CTA survey in 2009, the number of Tibetans in India was around 90,000. The figure 150,000 is the total estimated Tibetan population outside Tibet. So to say 150,000 in India is wrong. The total number of Tibetans in India today would be between 60,000 to 70,000. All the settlements are getting left with majority old people with only a handful young people. Monasteries are getting filled with people from the Himalayan region. Schools are left with few hundred to about hundred students. Nothing wrong in this, but this is the truth. Tibetan community is getting bigger in places like New York and Toronto, both registering more than 10,000 each. Minneapolis (Minnesota) probably has the second largest concentration in the US. Some smaller hubs are in California, Colorado, Utah and Portland. Belgium and Switzerland both have around 7,000 each, becoming the biggest hub of Tibetans in Europe. France, Germany and the Netherlands may have around 1,000 each. Guessing a little over 2,000 in Australia. May be 500 in Taiwan, 200 in Japan. The number in India will further decrease in the coming years. The restrictions, the opportunities and the quality of life is so great in India, that many would prefer where it is not overwhelming. Leaving India is the natural option. We will see even our Sikyong and Kalons will leave India after their terms are over. france has about 7,000 tibetans, and will have about 10,000 by 2020. Paris is becoming a hub of Tibetans in europe. france is giving asylum to any Tibetan within a couple of months. maybe they have an unofficial policy of resettling Tibetans from india? Recently I saw different census record of Tibetan population in India published by CTA and I was shocked to learn that CTA has no idea how many Tibetans living in India, Nepal and Bhutan. CTA has excluded those number of Tibetans who follow Shugden deity and non-payers of Chatral (feudalistic tax) in exile. Sonam Dagpo is a robotic figure in Gangchen Kyishong who do not have any slightest idea of Tibetan movement in exile. Many are naturalized Indian citizen after unsuccessful attempt of Westernizing dream. After 2 years, Tibetan population will be in the lowest number as HH Dalai Lama returns to China. In reality, no body knows exact number of Tibetans in India. In West Bengal and Sikkim, most of the Tibetans are mixed with local Indian population and census with Welfare offices is incorrect.